Six months have passed since the defeat of the druid-warrior Cael and Artan's return to the world of man. The ancient Celtic king is trying his best to fit in and adapt to the 21st Century but is having a hard time adjusting to the modern age. Once upon a time he knew his place in the world. Warrior. King. Gargoyle. But now he is a man adrift, lacking purpose and direction.This all changes when a dangerous warlock arrives in New York City hellbent on a quest to track down three magical Grimoires.As the necromancer's army of gargoyles, ghosts and the undead descend on Manhattan, King Artan is faced with a terrible decision -- remain human as New York City drowns in darkness or once again become a monster to save the world from a terrifying supernatural evil.Gargoyle Quest was really amazing for me because you get a lot of the soul searching conflict going on. Artan is stuck in a world he doesn't fit into or feels he belongs to, he loves his girl and used to being a gentleman and taking care of her but there's also an underlining hero complex he struggles with along with the dark secret he hides that he has to struggle with but its interesting to see the debate of whether he can embrace who and what he is and what his circumstances are now with trying to find a way to put it to use which is kind of what happens as all hell breaks loose.I like that readers really get a sense of feeling what its like for Artan to be on the outside looking in. You you feel his sense of seclusion and his apathy but you also get the struggle he feels with a need to do something while being held back because he can't really engage with this world in this time outside of what really makes him useful. So when the big bad shows up on his doorstep how could he resist answering the call?I really like this book because I have read it about a dozen times in a row and I still feel something different or something new when I read it because you see a different point of view.I think Massa's writing is great, I am so excited for the next installment. I love the supernatural/fantasy he brings to life and I love his characters. They are a cast readers can really love and relate to. I look forward to more life, more battles, and more love.BooklikesGoodreadsTwitterGoogle PlusBloggerPinterestAmazonFacebookWordpressRSSBlogLovinKrissy's Bookshelf Reviews received a digital copy/ purchased a print copy in exchange for an honest review/ for my own collection. All thoughts, comments and ratings are my own.Krissy's Bookshelf Reviews received a digital copy in exchange for an honest review from the author/ purchased a print copy for my own collection as well.If any of Krissy's Bookshelf Reviews has been helpful please stop by to like or let me know what you think! I love hearing from followers! Thank you! Thrilling story. I am glad Massa continued the gargoyle story. So often when I finish a book I think about what lies ahead for the characters, so it was great to continue Rhianna and Artan's story. If you liked Gargoyle Night you will like this one. "Gargoyle Quest "continues six months after the defeat of Cael the druid warrior who wanted to breakdown the veil to the Otherworld and unleash a powerful demon. Human again after centuries of being frozen in stone King Artan struggles to adapt to modern society, feeling adrift and lost without purpose or direction in his life. But that's about to change when he decides to help an Order of monster hunters destroy a deadly warlock who's searching for a magical power hidden within three Grimoires.This gripping and intoxicating urban-fantasy heats up when Artan McKeltar again sacrifices his humanity becoming a "gargoyle knight" to free Rhianna Sharpe the young archaeologist he's come to love from the clutches of Necron, a hybrid gargoyle who's determined to find and join the magic in the Grimoires to raise the dead and unleash an apocalypse. In his new mission he's joined by Nyssa and an Order of demon hunters, facing zombies, ghosts, a formidable necromancer and his army of gargoyles.With a fluid writing style and an enthralling plot William Massa keeps the reader on the edge of their seat from beginning to the end. Skilfully he sets the background for the rise of Necron from a hunt for a practitioner of the dark arts in Salem in 1582 only to have this old vengeance and evil set free in modern day New York. Although the story could have been developed further the tension mounts when Artan faces off with this new predator near the end almost succumbing to his inner demons and losing his life. This is a story of sacrifice, choices and the unconditional love that sustains them. Rugged and dangerous Artan McKeltar, King of Kirkfall is chivalrous, courageous and strong although adrift in a world he feels doesn't need his warrior skills. Haunted by the pain of his past he's in love with Rhianna Sharpe a polished and professional young archaeologist working at the New York Museum. Focused, strong and determined she's shocked when she can't find Artan after a party only to have him return to her as a hybrid gargoyle. Commander Nyssa like Artan is plagued by guilt in her past but is a skilled warrior mage who's dedicated and cool under pressure. But it's Necron a cold, vicious and ruthless enemy who adds a terrifying chill to the story. 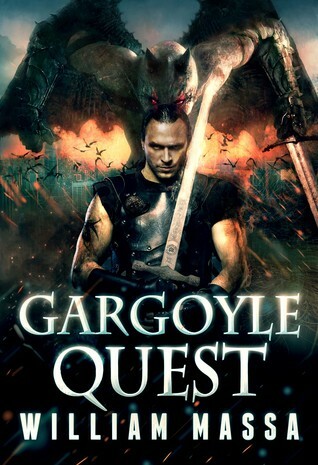 With these personalities and others William Massa infuses realism, excitement and high-energy into Artan's newest adventure.I liked "Gargoyle Quest " as Artan struggles not only to find his niche in the 21st Century but to stay alive when confronted by an Order and an enemy who are only too willing to kill him. It took me a few days to tackle this book, life and all. Having read the first book in this series, Gargoyle Knight, I wanted to read this one. It read well and the characters were solid, even the new additions. I couldn't quite get into this book as much as I did the first book though. It was interesting and certainly enjoyable but I found it didn't quite have the same appeal as the first book. The magic wasn't quite there as it were.There were several typos throughout the book which was a little distracting but overall this was an interesting and enjoyable enough read. Very excitingI am beginning to really like this series. It's a grown up adventure story. Once again it's got the evil sorcerer, a gargoyle, and a damsel in distress. This time around they have help. I like this series because everyone in the book are over the age of twenty and they seem more realistic. Also I like the action with the fighting. Maybe in the next book Rhianna might actually get to use a sword to protect herself. At least she's realistic at trying to keep herself alive when it is futile to fight back. Still I liked this book as much as the last one. Oh My Freeking God! This book was amazing! The first book was absolutely fabulous but this book, Gargoyle Quest was even better. Danger, magic, Deamons, Gargoyles, Worlocks, and now Deamon hunters! I can hardly wait for the next book to come out! Amazing! I loved this one. It's got a lot of suspense. I really enjoyed reading the book. SillyJust got silly. Couldn't decide if it was fantasy, romance, or mystery. And it didn't do much of a job as any of them. Maybe for middle school students.